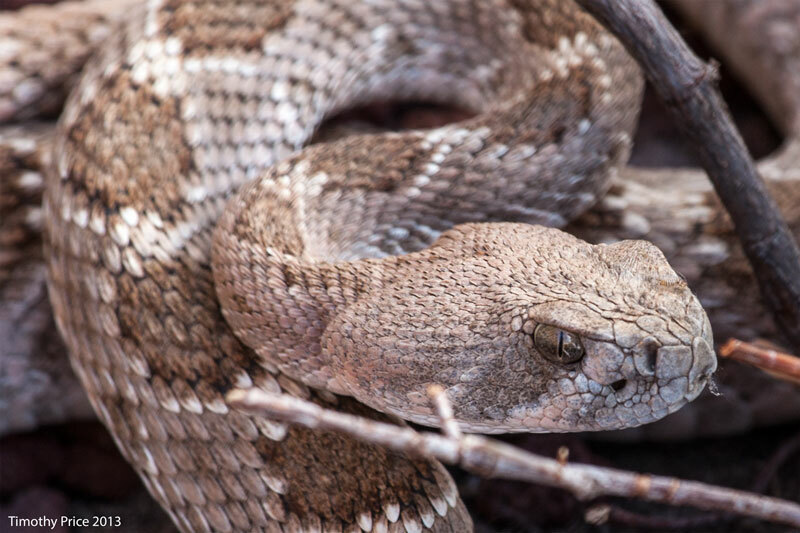 If you have never had the opportunity to meet a western diamondback rattlesnake up close and personal, meet Button. 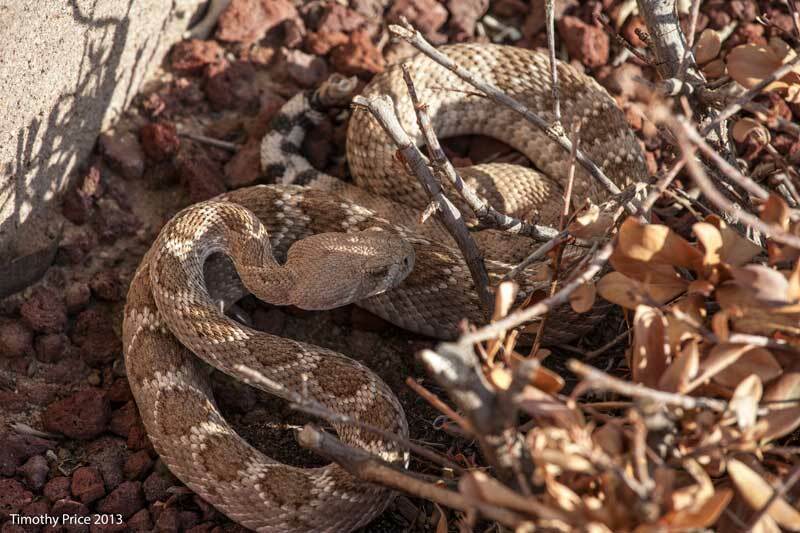 My sister called me after she left the office to tell me there was another rattlesnake in her garage, and she was not successful herding it back out to the mesa like the last one. She had found the rattles, which it had shed in the garage, and then she found the snake. Since the snake only has one button for a rattle on his tail, we named him Button. I drove by on my way home from work, and Dede had managed to get it in the opening of a large box. I tried to set the box up on end, but the snake crawled out before I could get it upright, and coiled up under a small bush. I noticed it was really skinny for it’s length (it should be 3 times thicker in the middle part of its body), and I called Tristan to see how long it would take her to thaw out a small rat, so we could see if it would eat before we moved it back out to the mesa. She had a couple of small rats already thawed out to feed her ball python, so she and David brought them over. Dede noticed the snake seemed lethargic — he was not at all aggressive, hardly flicked his tongue out at all, and he allowed me reposition him into more photogenic positions with a broom stick several times while we were waiting for Tristan. The passivity was probably a combination of the hunger (he probably hasn’t had anything to eat since last year), heat, stress, fatigue and being outside of his territory. Button was very interested in the rat we offered it and started to eat it several times, but he spat it out each time. We don’t know if the rat was not warm enough, not the right size, or that is was not wild, but he finally refused to eat it. I got Button back in the box, which was about 2 feet high, but he was able crawl right back out once I set the box upright. So we got him to crawl into a large trash can, snapped the lid on and took him to Tristan’s, where we set up a secure terrarium outside, and transferred him to it. Once we got Button into the terrarium, he became more alert and territorial. In the last photo he is in the aquarium checking out the air with his tongue and watching Tristan, David and me as we observed him and talked about him. Snakes can’t hear, but Button is so sensitive to vibration that he would turn his attention to whoever was speaking like he was listening to and participating in the conversation. 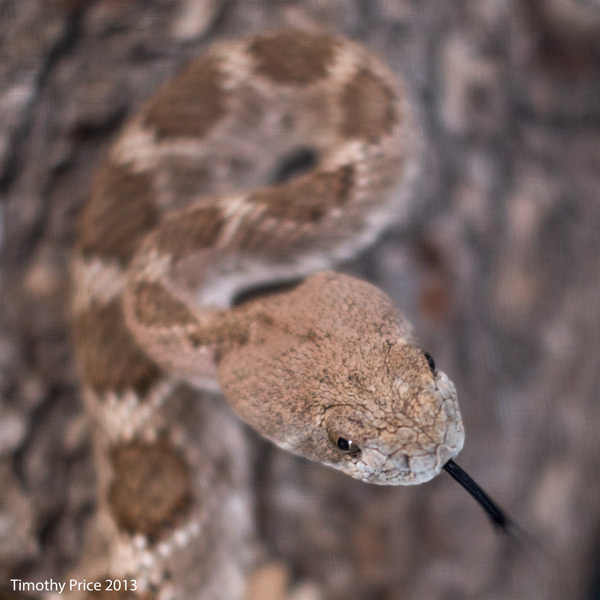 Rattlesnakes are very advanced reptiles, and appear to have more reptilian-type intelligence than other snakes (King cobras are reported to show a sense of intelligence as well). Once Button was in the terrarium, he changed his attitude, which could be because it was cooler and starting to get dark, but apparently he is content to be in the terrarium with a bowl of water, a nice hide box, and food after the trauma of being shooed out of a garage, photographed, herded into a into a box, and then a trashcan, and shaken around in my car on our way back to Tristan’s.